This church had its beginnings in 1910. The first meeting was held in the home of George Heitzmann with 23 charter members in attendance. Reverend F. A. Mueller was the first Pastor. Mr. Heitzmann donated three acres of land for the church and cemetery. Dedication services were held July 15, 1911. The church was renamed from Hilda to Germantown and became a member of the North American Baptist Conference. With 151 members in 1918, a new buiding was constructed under the leadership of Reverend E. P. Wahl. This building was moved into the village of Hilda and rededicated August 12, 1928. The name was again changed; the church was renamed Hilda Baptist Church. 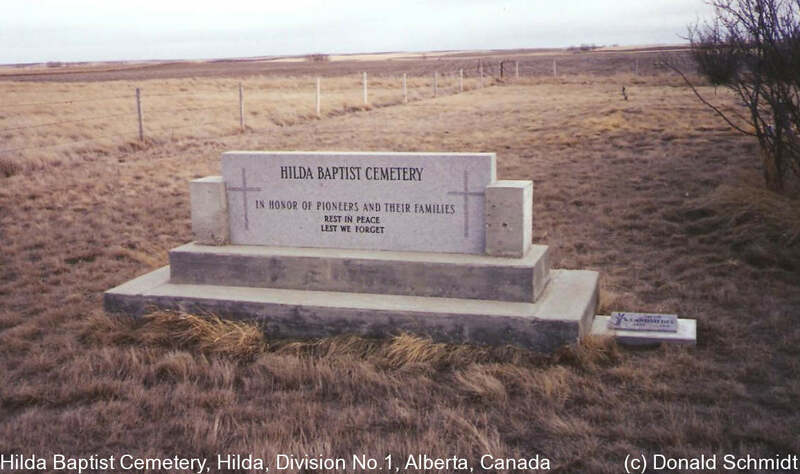 The cemtery is located one mile west and two miles south of Hilda, Alberta, Legal land description is NE 22-17-01-W4. Located at the junction of township road 174 and range road 12. There are numerous unknown burials. Note as at October 22, 2012, the following are not listed on the cairn: Elizabeth Croissant and JaKob Helm.